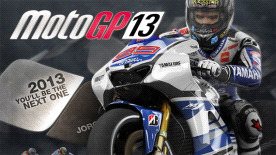 MotoGPTM official license: MotoGPTM13 is the official videogame of one of the most famous brands in sports. The game features all the official contents of 2013 Championship: real MotoGPTM, Moto2TM and Moto3TM riders, teams, tracks and rules are in the game, thus you can complete the new season before it actually occurs: will you be the new world champion? Into MotoGPTM world: loyalty to MotoGPTM spirit in all aspects of the game, from photorealistic graphics to TV style interface, including menus and sounds. You are the rider: thanks to a realistic handling you can really feel the bike in your hands and you can choose to ride with scalable aids or in pure simulative way for real fans! A new immersive career mode, with first person elements like 3d pits and helmet view, grants a full immersion in the rider’s shoes!